Neue Schule takes on a "new school" approach towards bit technology. With the help of computer design, Neue Schule has the freedom to be more innovative with creation of mouthpieces and cheeks to promote overall comfort for the horse. Neue Schule Salox® Gold rapidly reaches mouth temperature so the bit feels less like a foreign body in the horse's mouth, and aids in relaxation. 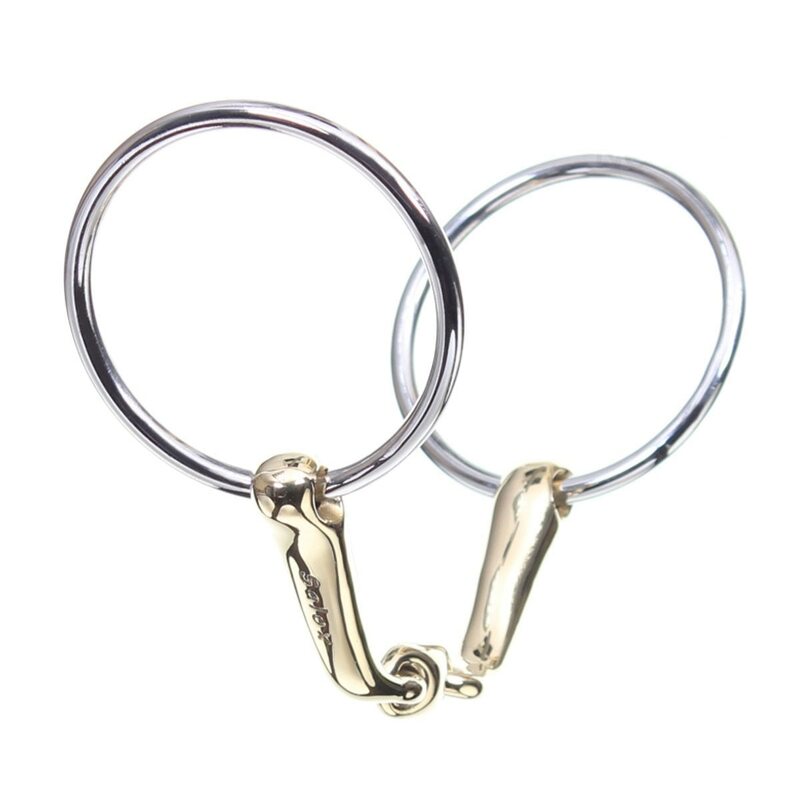 The Verbindend Loose Ring greatly emphasizes the signals through the rein. The Verbindend creates a channel for the tongue to lie in which allows the horse to soften and relax through the jaw, as well as prevent tongue evasions. Happy Mouth bits are uniquely constructed with high tech plastics, making them soft, flexible, gentle and comfortable for your horse. The unique apple scent increase your horse's acceptance. 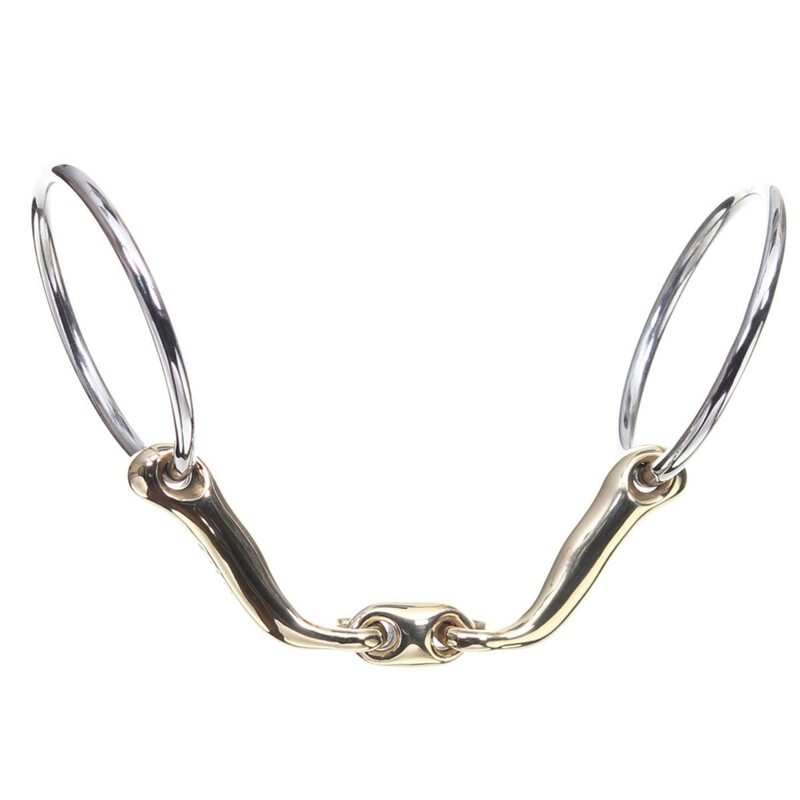 Neue Schule Verbindend Loose Ring - 16mm is rated 4.8 out of 5 by 38. Rated 5 out of 5 by Birdgal from A miracle for a horse with contact issues I have a young horse that is extremely fussy in the mouth and I literally had a bucket full of bits trying to find one that worked. I bought this as a last resort and it made a huge difference. He's still fussy but after warming up he will stretch nicely to the bit. This was impossible before this bit. Rated 5 out of 5 by cdanie9 from My horse seems to like it! My horse can be funny in the contact, but even after only a handful of rides using this bit he really seems more willing to push into the contact. Last couple of rides he has even gotten nice and foamy from accepting the bit! I think the shape of this bit really helps him stay soft, so you can "whoa" if you need to without stopping their hind end from coming through. Rated 5 out of 5 by Rose from nice bit I like the Neue Schulz range of bits in general. This is a great bit for a horse with a tense mouth. I also have the tranz angle lozenge. Rated 3 out of 5 by bellecavaliere from It's ok, not a miracle cure though. This is a very nice bit and does seem to help a little bit from preventing my horse from leaning, but its not a huge difference. He will get behind the bit some now instead of leaning, but we have only had it about two weeks now, so we'll see. My gelding usually rides in a 5 1/4", but I had to go up to a 5 1/2" with the Verbindend. Rated 5 out of 5 by Horsepower1974 from Love This Bit! So far I’ve had good results with it on three of the horses I ride. It seems to sit very comfortably in their mouths which has encouraged a steadier contact through the rein. It’s an expensive bit, but Smartpak’s member association discount and a coupon they sent me (from a previous purchase) helped with the cost. Rated 5 out of 5 by Megan from Great Bit Nice bit. I changed to this bit because my young horse had grown and needed a longer bit. I had a similar bit and the transition was easy. Rated 5 out of 5 by Mrs K from Great design My horse has a very low palate and he likes this bit. No more stiff jaw or grinding teeth. Rated 5 out of 5 by Jolene from Great bit! It has always been a struggle with my friesian mare finding a snaffle that she won't run through, lay on or avoid. Very happy with her response to this bit. She doens't run through it or lay on my hands as much. She seems to like it much better than the plain snaffle I was ridding her in. Rated 5 out of 5 by Calsmama from Great bit! Love this bit! Has helped me teach my big warmblood to get off his shoulders. No curling behind the bit. Seems to do all that it claims if you read the blurb that comes in the packaging. Rated 5 out of 5 by Diane from Best bit! My horse loves this bit and so do I. It fits well and the curve helps keep my horse soft.